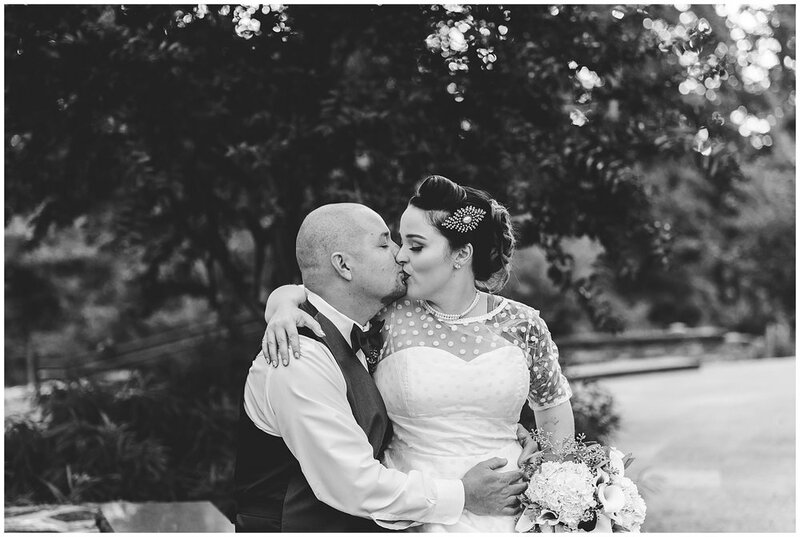 I've never had the pleasure of photographing such a unique celebration as Kat and Dave's 1950's/Rockabilly wedding, but goodness gracious great balls of fire...I'm a fan. A fan of Kat's, a fan of Dave's, a fan of their hilarious and fun bridal party, and a stalker status fan of their crazy-cool style. ps-sorry about that really lame attempt at a relevant song reference. Take note, everyone. Kat and Dave know how to throw an incredibly happy, unique, memorable celebration. 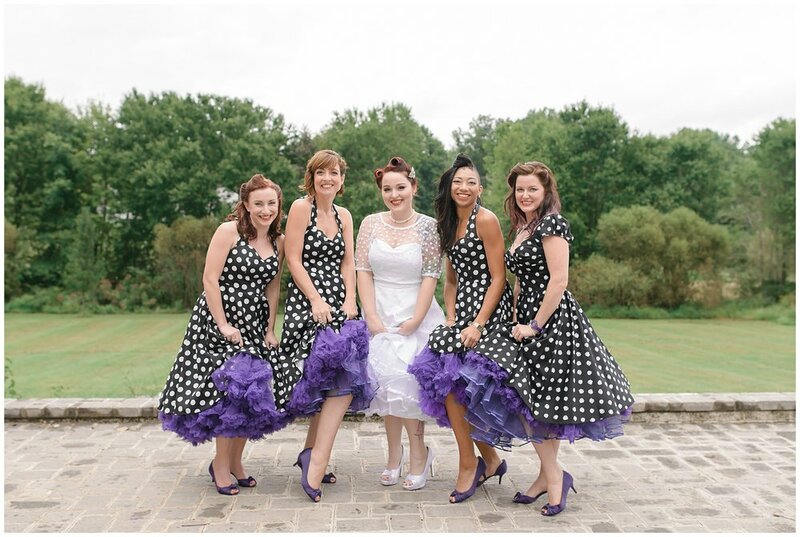 Black and white polka dots, purple bow ties and petticoats, piercing red lipstick, sweet motorcycles, and abundant "that's what she said" jokes from the bridesmaids had me on cloud nine. Oh, and an incredibly adorable darg (steph speak for dog) named Bella adorned with a purple handkerchief who was quick to adorn you with puppy kisses. GAH! It was pouring all morning/early afternoon, but we were blessed with a respite right as Kat and Dave had their first look, and by the time we were ready to jet off to the ceremony, the sun was beaming with fervor to suggest it needed to make up for lost time. 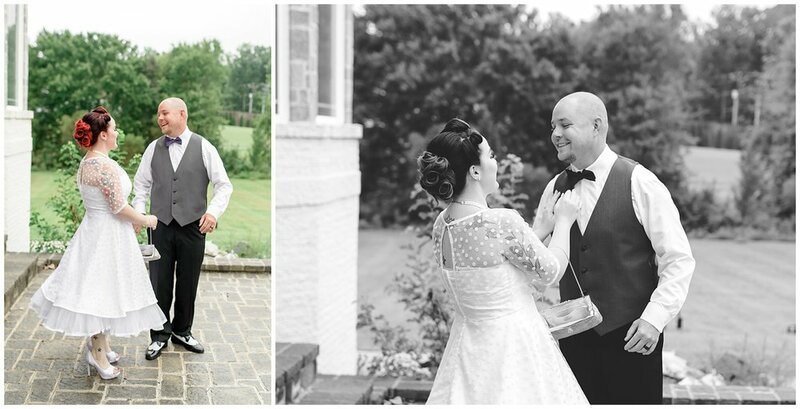 Glowy, warm, and comfortable, the weather mirrored the sentiments of everyone present for their intimate ceremony at the National Marine Corps Heritage Museum. Oh, and how awesome is it that they both took off to ride across the country on Dave's Harley for their honeymoon? Jeez y'all, stop hogging all of the cool. See what I did there? Jokes, I has them. Thank you both for your kindness, your sense of humor, and allowing me to be present for such an incredible occasion. Congratulations to you both, and enjoy a few (okay, a LOT because I loved them all) of my favorites from the day. Cheers! Kat spins in her dress, we all lose it. So gorgeous! First look time! The first one was with Kat and brother Mike. His reaction was so crazy sweet. We ran back inside for one last group shot before it was time to head to the ceremony, and I'm so glad this bridal party was cool enough to let me try out an idea unlike anything I've done before. Good "serious" faces guys. I'm totally digging this shot. Dave and the boys rode up to the ceremony on their Motorcycles...everyone certainly knew they had arrived! :-) Those suckas are LOUD and they looked like total bad-butts (keepin it G rated up in here). Time to celebrate! Old fashioned candy bar. 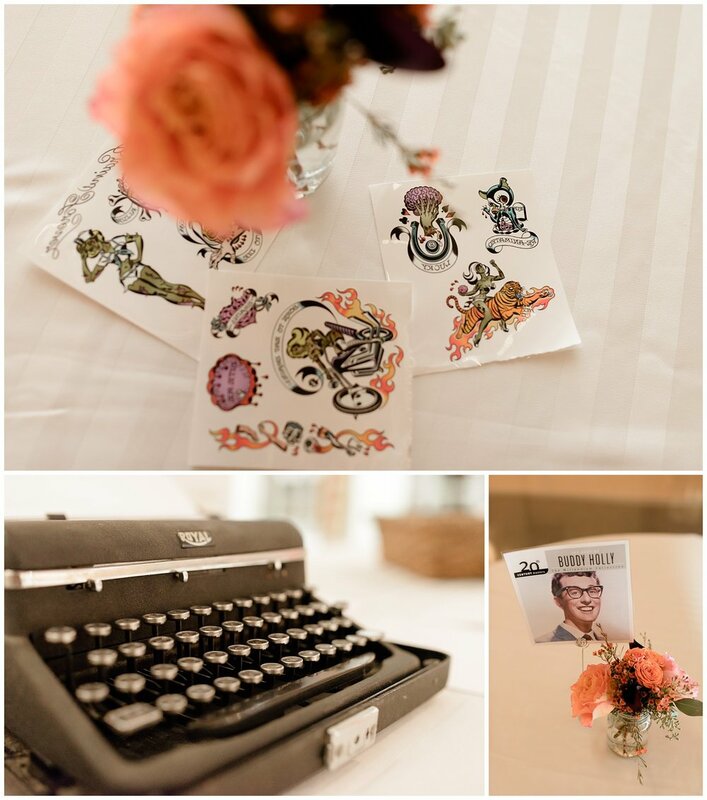 Temporary tattoos. Dance lessons for the guests. The coolest cake ever. Smiles everywhere. And like that, it was time for the last shot of the evening. Loved this one in front of the glowing museum. Cheers, guys, loved every minute.